Enchanted Excurse: Is Your Forest Dark? Afternoon Loverlies! 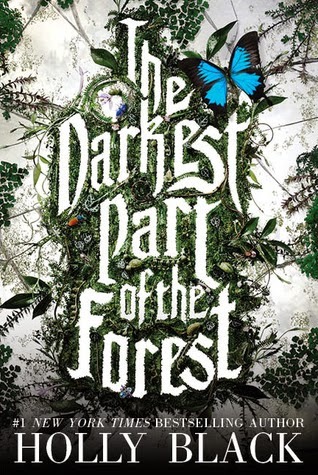 I have recently read The Darkest Part of the Forest by Holly Black. It is about a town that has FaeFolk living in it. The town and the fae have a pact in order to keep the fae from killing any townsfolk or tourist. But of course, you can not keep the fae from doing harm for too long. The main characters are siblings named Ben and Hazel. At a young age, they decided to start killing some of these evil fae. Later on a monster breaks the pact and starts causing deaths to happen. These events make them feel the need to protect their town and kill this monster. That is really all I will say about what happens in the book. This book was very easy to read and easy to stay stuck in the book. So easy that I read it in just only two days, lol. I enjoy stories about the fae world, and I believe Black did an amazing job of portraying it. I loved the twists that were in this book and also found it easy to like these characters. She also did an amazing job at how she explained what happened in the past to these characters. Even though I rented this book from the Library, I do believe it is a book that must be owned. I will have to make sure and purchase this book! Have a Blessed Day! I really liked this story, but it left me wanting more! Hope that the author plans a sequel, and I want to see what happens next for all of the characters! I agree with you! I also think it would be awesome to see this as a movie. Ty For leaving a comment :) I enjoy them!